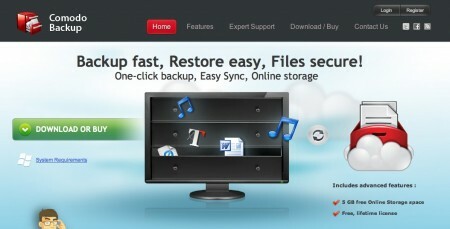 We have handpicked 10 top pieces of software that you simply must use in 2012 to make the most of your PC and the web. As we head into 2012, it’s time to think about how you can keep your PC fit, fast and up to date for the next 12 months. That means knowing which software you can rely on to perform quickly, safely and intelligently. This isn’t esy, because the web is teeming with thousand of poor programs that promise a lot but deliver little. Downloading these useless programs will only clog up your system and slow your PC down. So in this big post we we’ve identified the top 10 free programs that you should download to make sure you have a brilliant year online. Each program comes with a mini workshop explaining how to use a particular tool. Why you must use it : There are lots of different video file formats around, some of which will play on one device ( such as DVD player), but not another ( your phone, for example). Freemake’s superb tool lets you take any video file and convert it into a compatible format for you needs. It Supports more than 200 different video types, including AVI, MP4, WMV, MKV, MPEG, DVD, SWF and 3GP, and can also be used to download and convert web videos. The process is very straightforward : select the type of file to open at the top of the interface (Video, Audio, DVD, Photo, or Paste URL), browse for the file to convert, then select an output at the bottom of the screen. You can select on of the preset variations, or create a customized ( but still compatible ) alternative. You can do much more than just convert videos from one format to another, though. The software comes with an editor, so you can trim, rotate and flip clips, and its authoring tool lets you burn videos directly to DVD and Blu-ray. Unlike the other similar software, it dosen’t have the standard two-hour DVD limit and can burn up to 20 hours of content on a single – sided disc. This version of Freemake also convert video into an HTML5 – compliant format, which makes them easy to embed onto websites. In addition, the program can transform photos and MP3 into slideshows and upload them to YouTube, automatically cutting them into 15 min sections if required. Why you must use it : Hard disk can fail when you least expect it, and files can go missing apparently without cause. If you have a lot of irreplaceable content on your computer – documents, emails, photos, videos, and so on – it’s vital you back them up on a regular basis. 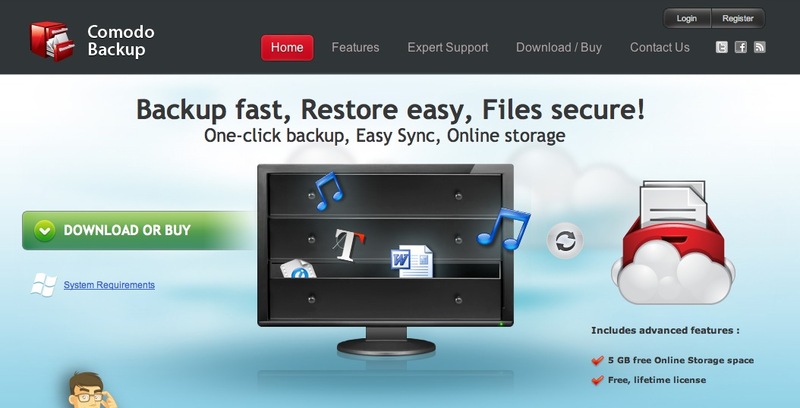 Comodo Backup is a superior solution that lets you backup any files to a choice of destinations, including to CD or DVD, or online, and it can be easy or as advanced as you want it to be. Once the program’s installed and you’ve rebooted, you can run the wizard and choose what to backup ( it will find important music, video and documents automatically ) and where to save it to, or take complete control and pick and choose the files and folders to include. You can copy your data manually, or scedule automatic backups. It’s an incredible flexible tool and will let you back up all sort of things, including selected Registry entries, and you can even use it to clone disks or partitions. Sign up for online storage and you get 5GB instantly for free. You can, of course upgrade to a paid plan at any time which is for $9.99 a month, and gives you a whooping 250GBto play around with. Backup tools tens to be either simplistic and lacking in features, or overlay complicated. Comodo’s solution is neither, and should appeal to all. Why you must use it : Left unchecked, your hard disk will start to clog up with junk – long – forgotten temporary files, empty folders, cached web pages, cookies, duplicate items, and so on. Over time, this can have a negative effect on your system, slowing it down and even causing it to crash. DrivePurge is a portable and comprehensive system clean up tool that cna clear out leftover junk and user tracks from more than 750 applications and system components. The software is divided into three sections, accessible via tabs at the top of the screen. System Cleanup check for junk files left behind by general Windows use. Microsoft components and installed applications; Drive Cleanup looks for old backups and temporary files; and User tracks Cleanup wipes usage history. It’s very easy to use, executing tasks in a very similar way to CCleaner. Click Analyze to look for files to clear and Cleanup to remove them. Despite its tiny size, and the fact this is its first version, it’s already very through, identifying files that other applications miss. Best of all, it gives you total control over what it should remove, so there’s no danger of accidentally deleting something important. The Drive Cleanup section lets you choose to target just backup files, temporary files, or other files, marking it brilliant for quick cleans. Why you must use it – A decent anti-virus tool will deal with most threats on your system, but Sandboxie, which comes in 32 and 64 bit editions, will prevent them taking hold in the first place. The software can sandbox any application, which means running it in a secure and disposable section of your hard drive to prevent it making any permanent changes to your PC. You can download and even run malware in the sandbox and it won’t be able to infect your system. The program is exceptionally easy to get to grips with and because it’s so lightweight, it won’t have any noticeable impact on your computer or slow it down. In fact, you probably won’t even know it’s running. It can sandbox anything, but some appliations are trickier than others. Fortunately, Sandboxie is able to identify potential compatibility problems with existing software and apply automatic configuration settings to make sure they’ll run as intended. You can create multiple sandboxes with different settings, clear all the contents when finished ( or save certain items, ) and kill sandboxed programs that start to misbehave. If you’re the sort of person who likes to download software from anywhere or who sometimes accidentally clicks dodgy links, Sandboxie can prove an absolute lifesaver. Why you must use it – If you have a lot of digital music on your computer, you’ll need a good program to organise and manage it. iTunes is the obvious solution, but it’s not necessarily the best, especially if you don’t own an Apple device ( or even if you do, for that matter ). MediaMonkey is a very powerful alternative that can organise and play music and videos, tag and sync content, find missing artwork, identify duplicate tracks, rip and burn discs, and convert files from one format to another. When you first run it, a wizar will load that you can use to import yuor music and video collections. It can also recognise if you ahave iTunes or Windows Media Player installed and import ratings and playback history from them. What makes MediaMonkey so great is that it offers a wealth of useful functions. If you’re having a party, you can use the secure mode to protect your library, so nobody can change the playlist. And there’s an Auto-DJ mode that will kick in when your selected tracks end. The software can download podcasts and monitor pre-set folders, automatically updating its library when you add new media. It can sync and back up iPods, iPhones and Android phones too, and share media with any networked UPnP or DLNA devices ( connected TCs or DVD players, for example ) . 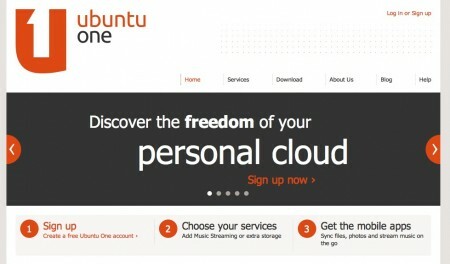 Why you must use it – There’s no shortage of decent free office suites available to download. If Mirosoft’s new cut-down starter edition of MS Office is too limited for your tastes, there’s always OpenOffice.org or LibreOffice. Kingsoft is probably not a name you’ll be familiar with, but its free suite is an excellent, solid alternative that does a superb job of mimicking earlier versions of Microsoft’s product. If you’re not a fan of the ribbon interface, you’ll love the familiarity of this suite, because it copies the older layout perfectly ( if you miss the ribbon yuo can get it – and other additional features – by upgrading to the Pro version for $69.95 ). The suite comprises a word processor, spreadsheet and presentation creator, and can open all the popular Microsoft formats. It can’t write to the newer DOCX or XLSX formats, although your’re unlikedly to need those. 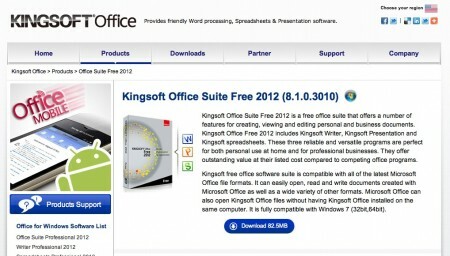 Files written in Kingsoft’s own format can be open directly in MS Office. All the features you’d expect to see are included, and there are various smart additional touches, such as a brilliant easy to use table lets you create new rows and columns simply by dragging. It can open multiple documents in tabs, save files in PDF format, email files directly through the software, and much more. It’s also smaller than other office programs, making it quicker to install and run. Why you must use it – Ultimate Windows Tweaker allows you to tweak various settings in Windows 7 and Windows Vista, this freeware will let you easily customize and change your Windows 7 (Windows 8 support to be added later) look – like changing the Start Button, Logon Screen, Thumbnails, Taskbar, Explorer look, Windows Media Player, etc. There are tons of applications available to customize your Windows installation, but the problem is that most are tweak specific. Hardly any offering multiple customization options. Ultimate Windows Customizer (UWC) is the first integrated freeware that offers you almost everything that can be customized in a Windows installation – well everything that matters, at least! 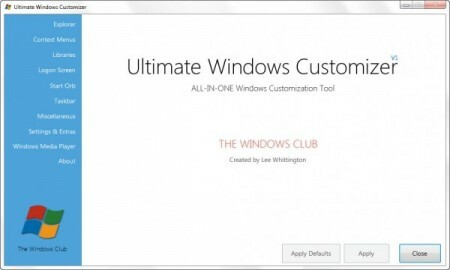 Once you have downloaded Ultimate Windows Customizer, unzip the contents, open the folder and click on UWC Setup file to start the installation. The installation is simple and there are no boxes to check/uncheck. It is completely clean, and like all our other Windows freeware does not include any of the hated toolbars or accompaniments. You can see the UWC Installation Screenshots here. Why you must use it – WinContig is an easy-to-use stand-alone defragmentation tool that doesn’t create any installation directories or Registry entries on your computer. Its purpose is to quick defrag files without the need to defrag the whole disk. In addition, WinContig allows you to group files into profiles, and also it accepts a number of optional command-line switches that you can use to control how the program operates. WinContig is a standalone executable, and it doesn’t require any installation process or additional DLLs. In order to start using it, just extract the contents of the ZIP archive to any folder you like, and run it. 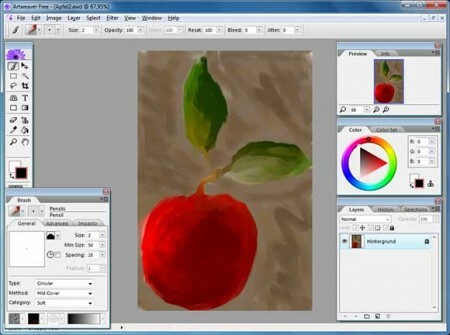 Why you must use it – Artweaver Free is a freeware painting program which is suitable for beginners but also suitable for advanced users. You can record all your steps and replay them afterwards or provide them to other users. Also there are many tools and features like layers and effect filter in Artweaver Free. Why you must use it – Sync & 5GB storage free – Keep your content safe, access it anywhere, and share it with friends, family and colleagues. Music Streaming – Stream your entire music collection via the web or to your iPhone or Android, listen offline and get 20GB of storage for all your data. Photos and files on the go – Files apps for Android and iOS let you manage your photos and files directly from your mobile device.